To celebrate five years of NT100 we’ve revisited Quipu to understand what’s helped the initiative grow, since it featured in our 2015 NT100. Vigo is one of an estimated 272,000 women and 22,000 men sterilised without informed consent in Peru, during Alberto Fujimori’s rule in the 1990s, as part of a ‘family planning’ campaign funded by a range of government and NGO grants, including a $36 million donation from USAID. At least 18 adult deaths were recorded during the campaign. To date, Vigo, who was 32 at the time of her sterilisation in 1996, is the only surviving sterilised Peruvian who succeeded in receiving damages of approximately £2,000 after years of lengthy legal wrangling. She believes that she received compensation in part because she is educated and speaks Spanish, while the majority of sterilised women and men are members of indigenous Quechua-speaking communities in remote areas of Peru. Operations were usually rushed, and carried out in unsanitary conditions by inexperienced personnel coerced or incentivised to do the work. Patients – many of whom were pregnant before the sterilisations – were made to walk home straight after, with no follow-up care. Men and women were often bullied into providing consent, by being threatened with fines or taxes, or by being told that their child support would be withdrawn. The international community initially commended Fujimori’s campaign for making family planning accessible, but concerns soon emerged about methods on the ground, which appeared to be more about population control than reproductive choices. “Instead of promoting a range of contraceptive methods, there were targets, quotas and numbers of sterilisations that the health personnel had to achieve,” explained Rosemarie Lerner, director of the Quipu project, when speaking to the BBC. A filmmaker from Peru, Lerner was studying in London when Fujimori’s daughter Keiko was running for president, while her father was imprisoned for human rights abuses unrelated to the forced sterilisations. Keiko’s opponent Ollanta Humala brought up the issue in a bid to discredit Keiko, who at the time held a strong lead. Lerner followed the elections closely, and in 2013 her film production company Chaka Films teamed up with academics Karen Tucker and Matthew Brown at Bristol University, and British creative technologist Ewan Cass-Kavanagh, to gather and publish more testimonies from the women and men targeted by Fujimori’s campaign. Thanks to funding from REACT (Research and Enterprise in Arts and Creative Technology), the team set out to explore the possibilities for documenting what happened in Peru, combining their skills in research, film and technology. The first women Lerner met during research trips back to Peru were initially reluctant. “They had lost their trust in the traditional media, because they felt that they were being used,” she explains. “People came with cameras, and they never saw them again.” Similarly, there was mistrust of non-profits, some of which were perceived to hijack the issue to get funding from international organisations, without helping, or even contacting, those affected. A Peruvian friend who was working with indigenous populations in the Amazon taught Lerner that the only technologies available across Peru were phones and radio. The team were further inspired by mobile-phone platform WeFarm, which was at that time trialling a way to connect Peruvian farmers without online access; an internet for people without internet. When Cass-Kavanagh told the team that phone content can be recorded and archived online via VoIP (Voice over Internet Protocol), the idea for a forum for sterilised people to tell their stories via mobile phones that could be archived online and shared internationally was born, and named Quipu. The word means ‘knot’ in Quechua, and refers to an ancient Andean system for recoding information using knots on strings and ropes. The technological solution was developed with the local population in mind. The team purchased an ‘0800’ number in Peru from US-based cloud communications provider Twilio, which anyone could call for free from a mobile or landline. A recorded message in both Spanish and Quechua explains that the Quipu project is about collecting and publishing testimonies about forced sterilisations under Fujimori, and asks callers to press ‘1’ to leave their own story, or ‘2’ to listen to other stories. A caller can then tell their story through the phone, which is played back to them for approval. Once they are happy, they press a button to archive the story in the cloud, and are given a unique code, which can be used to access it at a later date. At the same time, the Quipu team moderate and translate all stories into Spanish, Quechua and English, with the help of volunteers. The stories are published on the Quipu website, together with background information about the project. Visitors to the website can also leave responses, which are again translated and added to the phone system, so they can be accessed by phone back in Peru. Once Quipu was up and running, Lerner and her team travelled to the remote rural regions of Peru where most of the sterilisations took place, meeting with local associations, organising public meetings, running public radio campaigns calling for testimonies and creating easy-to-understand brochures that helped people navigate the project, and write down their unique code for their story. In spite of initial hesitance, local women and men soon welcomed Lerner and her team, and started not only contributing, but leading the project, using Quipu’s platform to organise, protest and demand legal recognition and reparations for what happened. To date, over 2,700 people have called the phone line, leaving over 150 testimonies. 21,000 people from 127 countries have visited the website, with 60 leaving responses of encouragement and support in several languages. While the numbers themselves may seem modest, the value of hearing what happened directly from those who experienced forced sterilisations is immense. Patterns have emerged about the methods used by the government, the conditions during the sterilisations, and the lack of care afterwards, as well as the chronic illnesses, damaged relationships and psychological trauma reported by many who were sterilised. Women and men who live hundreds of miles apart and have never met tell the same stories. 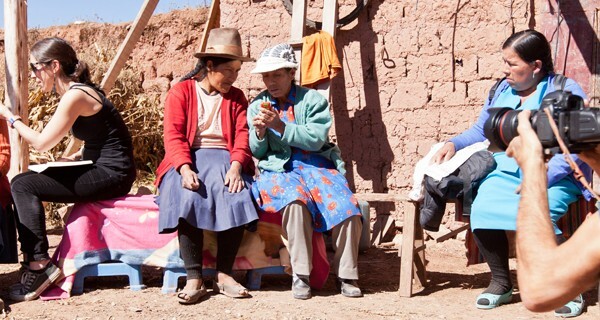 Thanks to Quipu, people who did not even know that sterilisations happened outside of their own communities can now connect to each other through phones they already use, and learn how to leverage their knowledge and mobilise for justice. Quipu testimonies have now been shared with Demus and Instituto de Defensa Legal (IDL), two legal organisations in Peru that are working to represent sterilised women and men in court, who can use the testimonies to cross check against other court testimonies and strengthen their cases. Progress is slow. While President Humala introduced a national registry for sterilisations in 2015, only 5,000 cases have been added so far. Sterilised men and women also face opposition in their own communities where Fujimori was popular. Concern for the safety of those who leave testimonies means that all recordings on the site are anonymous. Some of the women express frustration at nothing being done, in spite of raised awareness and protests. Nevertheless, responses left on the website provide encouragement. “I want to salute the Peruvian women, the indigenous, tell them that they must continue fighting,” says a woman from Ecuador. “Please carry on fighting for justice,” says a man in the US, with Peruvian grandparents. “Behind each of you there are hundreds of us supporting you each step of the way,” says a woman from the Middle East." The team will return to Peru to host one last workshop to understand how to measure Quipu’s impact, before working on an academic report and a multi-platform guide for others thinking about starting similar projects. Quipu is currently funded to remain online until the end of 2018, at which point a new host will need to be found. British Library and the University of Bristol will archive all testimonies for at least 20 years, so they can be accessible to researchers, journalists and lawyers. The project is also currently exhibited at the Museum of Memory in Lima, established in 2014 to address years of violence in the country.